Jeppesen has successfully implemented its full global library of digital terminal charts, including approaches, arrivals, departures, and airport diagrams, with the Airbus A380 Electronic Flight Bag (EFB). The Jeppesen electronic chart application is fully integrated into the Airbus A380 EFB, eliminating the need for airlines to manage thousands of paper charts. 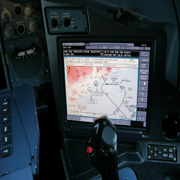 Jeppesen electronic charts can be used in all phases of flight, and both EFBs are fully interconnected allowing the captain and first officer to easily coordinate charts and information when necessary. A connection to the FMS reduces crew workload by helping pilots organize charts per the FMS-entered flight plan. Jeppesen electronic charts can be displayed in a day or night mode, and configured for multiple views, such as full chart, or combinations of the header, plan view and minimums. Charts can be printed on board should the crew desire hard copies. Qantas, the launch customer for this service, recently took delivery of the first Airbus A380 equipped with Jeppesen electronic charts and is operational now. Jeppesen is also working with Singapore Airlines to deliver electronic charts for its Airbus A380s.